A highly desirable state of Johnson's popular southwest map. Johnson's California, with Utah, Nevada, Colorado, New Mexico and Arizona. This is Johnson and Ward's desirable 1866 map of the American south-west. Depicts the state of California and the territories of Nevada, Utah, Colorado, Arizona and New Mexico. Offers superb detail throughout noting mining districts, emigrant trails, the Santa Fe Trail, the Pony Express Route and several proposed railroads, as well as American Indian tribes, geological features, and local political divisions. Features the fretwork border common to Johnson's atlas work from 1864 to 1869. This important map went through several different states during its publication period from 1861 to 1870. This critical period of westward expansion saw incredible development and change throughout the region. Collecting the various states of this map has become something of a sub-genre for south-western map aficionados. Johnson updated the plates for this map annually and sometimes even issued multiple variants the course of a single year. This example, which was introduced in 1864, represents a complete re-engraving of the 1862-1863 map. Johnson added considerable detail in the mountainous regions of California, Nevada, and Colorado. Arizona and New Mexico appear as independent territories but, for the most part, adhere to the old 'New Mexico' county structure. The southern boundary of Nevada with Arizona is set at 37 degrees of Latitude such that Las Vegas, which is noted, rests firmly within Arizona. The Utah-Nevada Border is set at 115 degrees of Longitude, roughly one degree further west than it is today. Though copyrighted to 1864, this map was issued as plate nos. 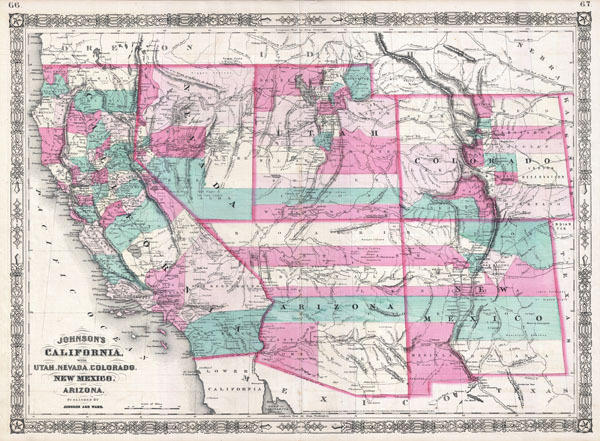 66-67 in the 1866 edition of his New Illustrated Atlas…. It is identical to the 1864 edition which bore the same page numbers. This is the last edition of the Johnson's Atlas to bear the Johnson and Ward imprint. Very good condition. Original centerfold. Text on verso. Verso repair to bottom margin just left of centerfold. Extremely bright and clean example.